"I named The Table Farmhouse Bakery for this Easter passage in the Bible. The surprise gift that God always brings to the table of our hearts is a revelation of himself and his forgiveness, hope, intimacy, guidance, blessing and presence. From table to table--the home of the tax collector Zacchaeus, the wedding feast at Cana, a meal with pouting Pharisees, the Acts dinner huddle before he walked through the walls--God always comes to the table with a gift, a revelation of himself. When I was around six years old our family lived in an apartment complex, and the local community center organized a huge Easter Egg Hunt. 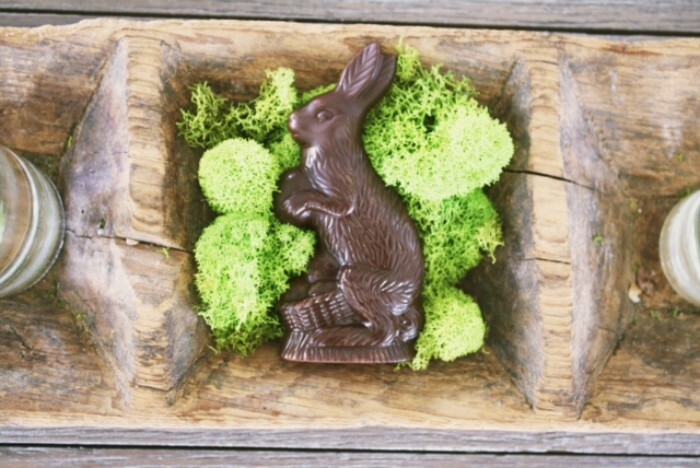 The grand prize of a big bunny made entirely of chocolate was awarded to the child who found a special golden egg hidden amongst the other regular eggs. Guess who found the golden egg...ME! When I first glimpsed that shimmering golden egg, I reached for it with such excitement, hope and joy. I've been thinking about that memory a lot this week. I walked into The Table yesterday and saw it filled with people enjoying their meals, the atmosphere enveloped in rich, sweet-sounding conversation. Then I walked outside behind The Table and entered into the old Cranford Industries mill. Standing inside that dilapidated, broken building I saw the beautiful potential in the Mill 133 restoration project we're beginning. That night, I sat around a table with several of my employees, and we told stories, laughed and cried. And even this morning before work, I received much needed encouragement from my husband, simple but powerful. When I allow God to open my eyes to see these everyday things, I find my golden egg again and again. I get the surprise gift of God's provision, faithfulness, goodness and unfailing love. I hope that this Easter, as you sit with family and friends over a meal, may your eyes be opened to his deep love, the gratitude of your grace-filled blessings and the nourishment that comes from just spending time with one another. In the busy world that we live in, may we all take the time to stop and set the table of our hearts with great expectation of God's presence. Join us around our table the Saturday before Easter (April 15) for Brunch, and keep your eyes open for Golden Easter Eggs. Along with regular, colorful eggs with Table sweets inside, an additional 5 Golden Eggs will be hidden throughout the day outside around the lawn. Each Golden Egg will contain a fantastic Table "grand prize" that you can redeem at the counter. May the odds be ever in your favor, and Happy Easter, Everyone!" Ladies Night Out is TONIGHT, April 6th! Drop by The Table for $2 LAVENDER CAPPUCCINOS. Our hint of housemade lavender syrup is delightful with espresso and warm milk. Aromatics and presentation are taken to another level with the delicate lavender blossoms topping. This Friday (April 7th) is 1st Friday AND our 1-Year BIRTHDAY at The Table on Elm! Come check out downtown and stop by our bakery/coffee shop for HALF-PRICE LAVENDER LATTES! Our quaint, little alleyway is the perfect place to sip on lattes and indulge in our housemade ice-cream sandwiches with your friends. Chocolate chip cookies + Homeland Creamery ice cream = A GOOD TIME! Plus, you can enjoy the beautiful Spring weather. We'll be open later--till 9:00pm! Need items to fill Easter Baskets? The Market has a variety of fun gifts this month, including new Table t-shirts, mugs and hand-poured chocolates made by our incredible pastries chefs. We also have a variety of homeware products, tea pots, water pitchers, flower vases, cups and saucers that are great for wedding or birthday gifts. Our Baristas stock our retail with incredible, freshly roasted coffee beans that you wouldn't normally find in a store. This month we're featuring Bonta from Counter Culture. "This coffee is the fruit of hard work done on about two dozen family farms in a small village of Bonta, in Papua New Guinea. Small lots from these farms—primarily consisting of Bourbon- and Typica-variety coffee—are separated and processed for us by our longtime partners, the Colbran family. The result is a savory coffee with notes of dried fruit and citrus." If you want to try expanding your coffee palette, try a classic americano from our Espresso Counter. All of our coffee drinks are made using locally sourced Counter Culture coffee beans (Durham, NC). Skip the Peeps, instead get Table Treats! *Call either Table location 2 business days in advance for any PRE-ORDER items for the month of April. Please note that each Table location has differing baked goods and retail available. Spring means new, delicious ingredients! Executive Chef Deanna says, "Here at The Table, it's important to us to update our menus to reflect the season's changes and to refresh your palates." Our signature items will remain, but you'll see more Spring berries in our Breakfast items (like our Raspberry Apricot Brioche French Toast)! On our Lunch Menu you'll see that our Chicken Salad Sandwich is back along with Beef Tenderloin on Ciabatta, Grilled Chicken Berry Salad and BLT Salad with Creamy Herb Dressing. The Table will be participating in Dining Out for Hospice in a few weeks on Wednesday, April 26th. We are committing to give 10% of all our sales that day to The Randolph Hospice House. This wonderful non-profit organization has been serving our community for over 34 years by offering specialized end-of-life care for patients and support for families. Visit their website here and learn more about ways you can help! Mark your calendars! Friend of the Table Donna Allen recently opened a charming women's boutique next to Positano's Italian restaurant across the street from us. Her shop, Nella Boutique, will be partnering with The Table next month for LADIES NIGHT OUT on Thursday, May 4th. Along with their trendy, affordable fashion items for sale, they'll be open late offering some Table treats. The Table's 4th Birthday Celebration! Click here to listen to Victoria Victoria's new album Coastal Beast on iTunes. If you haven't yet, check out the new Mill 133 Website, Facebook page and Instagram. Stay updated and let's sow and rebuild together!